Besides for experiencing the weather yourself, you know it's a great day in Cape Town when you hear the buzz of microlights in the air. The winds in Cape Town get so strong, gusty and difficult to predict that I've never seen a microlight or hang-glider out except on beautiful, clear and mostly-windless days. 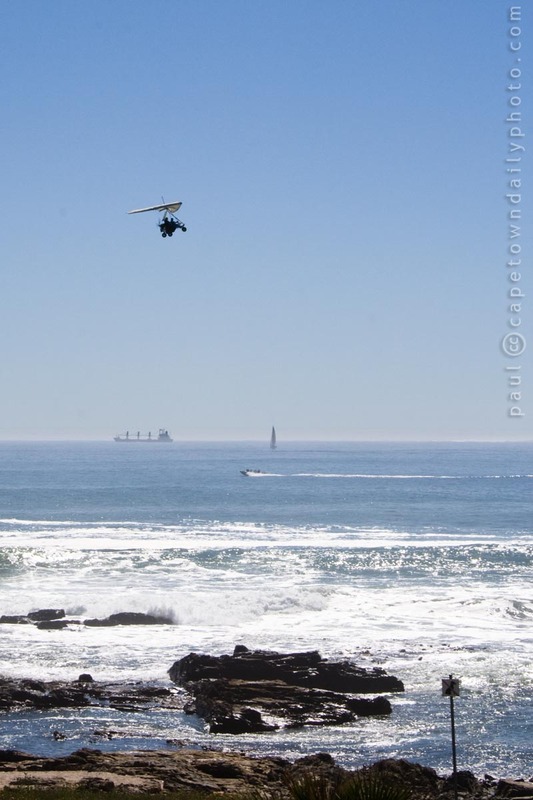 If you'd like to take a microlight flip in Cape Town take a look at Aquila Microlight Safaris - from their site it looks like it'll cost you between R500 and R1000. I've never taken a trip with them, so I can't vouch for the experience, but I can only imagine that you'd get some great photos from the open-air cockpit of a microlight! I did some hunting around and I can't seem to find anywhere that one's able to hire a microlight in Cape Town, so for the moment taking a flip as a passenger may be your only option. If you do know of a place, please be so kind as to leave a comment on this post. Posted in General and tagged flying, sea, sport on Saturday, 18 September, 2010 by Paul.